I recently received a news release from The Council of State Governments headlined “New Report: Renewable Energy Worth Investment for Southern States” that touted “job creation, environment and public health” as benefits. It was filled with lies. I had never heard of the CSG before, but a visit to its website was notable for its lack of specific information about its funding, its affiliates, and its programs, though it does mention three Governors on its "leadership" page out of only four leaders. They were from Montana, Puerto Rico, and Alaska. Other than its Washington, DC office, it did not specifically identify its regional offices. It does have an extensive staff and it appears to be yet another lobbying organization, one of thousands in the nation’s capitol. “Atlanta—Renewable energy has the long-term potential to leader to greater energy independence for the United States, but Southern states are looking to that sector for job creation, as well as environmental and public health reasons. Those states also believe renewable fuels have the potential to produce lower utility rates for consumers.” Not one southern governor was cited as supporting renewable energy. The United States does have the capacity to become more energy independent because it is home to vast reserves of coal, oil and natural gas. The policy of the Obama administration has been to attack existing coal-fired utilities and coal producers despite the fact that it accounts for fifty percent of all electricity generated. As for oil, literally billions of barrels remain untapped and unused because successive administrations have limited or banned access to it. Renewable energy for the pupose of this discussion will be wind and solar power. They provides less than three percent of the electricity American consumers use daily. 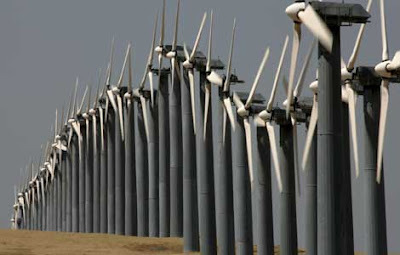 In December 2010, an editorial in The Wall Street Journal, “The Wind Subsidy Bubble”, noted that the industry received a $3 billion grant from the Obama administration despite or because the American Wind Energy Association is on record saying that without the extension of the federal 1603 investment credit, the outlook for the wind industry was grim and had the potential for the loss of 20,000 jobs, one quarter of the industry’s total. It may come as a surprise that environment groups who one might think would favor electricity generation from the wind and sun have rejected specific projects such as Brightsource Energy’s massive Invanpah Solar Generating System in the Mojave Desert that would cover 5.6 square miles of desert to produce 370 megawatts of energy, about the same as a small coal-fired plant. “It would destroy the entire Mojave Desert ecosystem said the southern California group called the Wildlands Conservancy. According to the U.S. Chamber of Commerce, of roughly 300 projects delayed or killed over the last few years, 65 were for renewables. The assault on the “dirty” energy, coal, continues unabated by environmental groups such as Friends of the Earth and the Sierra Club. Wind and solar projects are hugely expensive, require massive taxpayer subsidies, while producing few real jobs. They are astonishingly stupid and unreliable way to generate electricity when one considers that wind power, for example, requires a constant backup supply of electricity from traditional generating facilities. To add insult to injury, virtually all of the components of wind and solar energy production are manufactured in China where U.S. companies have exported the jobs involved, focusing on assembling the parts instead. The Institute for Energy Research found that electricity prices are almost 40% higher in states with mandates for their use. In July, New Jersey Gov. Chris Christie pulled out of the Regional Greenhouse Gas Initiative, a consortium that would have required renewable energy use for the provision of electricity. In Pennsylvania, Gov. Tom Corbett has been aggressively de-emphasizing renewable energy use and energy conservation. He has shut down the state department of environmental protection’s office of energy and technology development. Support for “green energy” and “green jobs” by the Obama administration is just one more way to further bankrupt the nation. If its attacks on traditional generating facilities continue, America will become a third-world nation with rolling blackouts and brownouts. Like everything else with the word “green” attached to it, renewable energy is just another massive scam like the all the lies that kept global warming going until that enormous and costly hoax was finally discredited. I Love Solar & Wind Power. Before you go for your gun, let me explain. I live on a boat with ample solar panels, and wind a machine. They keep the batteries topped, except when there is no sun, or wind. Then I have to fire up the generator, or run the main engine, which I have to do occasionally, even though I am currently in the usually sunny, and windy southwest Caribbean. The point of this post is: Solar, and wind have their place, but only for individual applications, not to power an entire country. More Than 900,000 Total Page Views! Video: Telling It Like It IS!